There are many ways to get users to promote your app, ranging from engaging viral game mechanics and shareability, to social and paid media promotion. 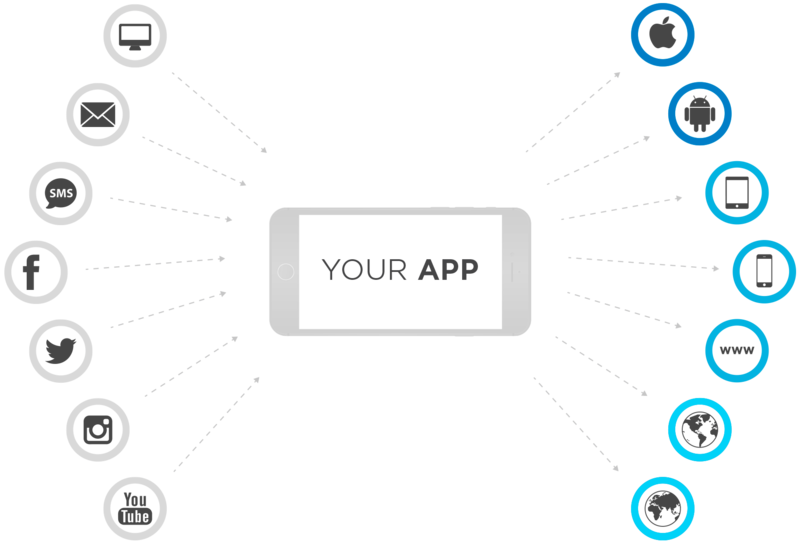 Take advantage of Free App Analytics (FAA) to gather as much user intelligence data as possible to evaluate your progress and determine the most effective way to engage new users to download and install your app. You may also have spent money to promote your app on major social platforms like Google, Facebook, Snapchat, or Instagram. These are examples of paid media. It is important to track both owned and paid media on a single platform to compare the effectiveness of both. This is holistic attribution. Too many marketers underestimate the impact of their owned channels. With FAA, you can track your owned campaigns to see which channels and messages are most effective in reaching users. Strong email campaigns, relevant social posts and valuable web content will boost your followers and offer affordable ways to market your app. SmartLinks is a key feature that allows you to specify multiple redirect destinations based on the device type, operating system (OS), geography, and other factors. A single URL link will send iOS or Android users to the correct app store. If your app is supported by a newer OS, you can configure the SmartLink to redirect users of unsupported devices to a landing page where they can download the app when they upgrade their device. Using SmartLink is also the only way to measure unattributed (organic) installs important to understanding your audience. After a campaign, compare how well your owned channels performed by looking at install volume or other key performance indicators (KPIs), such as purchases or registration events. Seeing how each campaign performed (i.e., what actions users took) will help determine how you plan the next campaign. For example, you might consider more on a definitive call to action on your website to download the app, use a coupon code, or perform some other specific action. Pro Tip: Use SmartLinks for all your owned campaigns to ensure that your users always have the best possible experience. A logical next step in your marketing effort is paid advertising on Google and/or Facebook. Because of a combination of user volume and known attributes of users, these two popular platforms cover 75% of the mobile audience. Instagram and Snapchat are also strong platforms, so knowing where your users are coming from will indicate which platform they frequent the most. It is not uncommon to see attribution overlap among these platforms. Paying close attention to the influencer report will help you understand what other channels are influencing though not winning attribution. When you’re ready to seek out new places to run paid ads, it can be tough to know where to start. Kochava has compiled an extensive Media Guide where you can filter and search thousands of potential ad partners. You can begin searching for partners by filtering the list using fields like geographic regions, channels, mobile platform, type of ad, and type of pricing. Once you’ve built up a fan base and know your users better, you can expand your marketing efforts to explore new audiences likely to enjoy your app. The Kochava Collective is a unique marketplace that provides marketers with access to rich targeting for users across networks. It’s like having the data of Facebook or Google without having to advertise on their networks. Marketers can create custom or lookalike audiences and target them with precise campaigns through any one of 20+ different activation partners. Purchase pre-packaged audiences created from a variety of categories such as Mobile Games; Music & Entertainment, Social Media, Communication & Dating; Travel & Weather; or Lifestyle. Build custom audiences using criteria such as recently visited locations, application usage, audience interest and device details. As you create your audience, the list of estimated devices updates in real time showing how the segment will look. Import your own audience data in the Collective to create a lookalike audience to upload onto a site (e.g., Facebook). Your audience data remains private and is never shared with anyone else. A good place to start is to explore pre-packaged audience categories similar to your own. For example, if you have a financial app, search for users within that category. Take your time in exploring and considering how you want to expand your audiences. There’s no magic formula that lets you “set and forget” marketing for your app. Great app marketing is engaging in the process of evaluating your data and adjusting campaigns to be most effective. Explore your data within FAA. See how users are finding your app to learn how to optimize that process. Pay attention to what users are doing inside your app, beyond the install, to maximize registrations, ad views or purchases. Additionally, see if users are getting stuck at a particular point in your app and figure out how to improve that experience. It’s important to keep asking yourself: Are these users generating revenue? If not, how can I engage them further? Or, should I try a new audience? Track all your user touch points with FAA, and see where you can connect with your audience again through new content, or where you can expand your user audience.